The title of this political drama by playwright Eleanor Burgess is ironic, as few niceties are demonstrated. 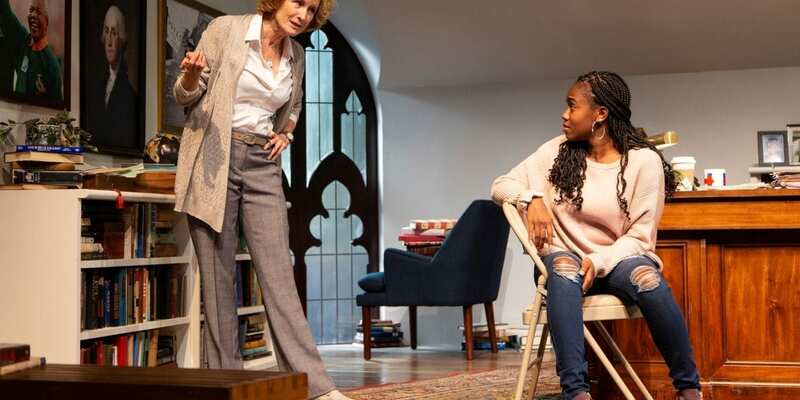 Instead, the play, which had its opening night at Princeton’s McCarter Theatre on January 19 and runs through February 10, is an intense verbal duel between its two characters. As directed by Kimberly Senior, the tension never falters. They both make cogent arguments, but their disagreement is in part a matter of intellectual frame of reference. Janine is arguing from the point of view of a political historian, to whom the thoughts and actions of leaders who have left a paper trail constitute “history.” Zoe is arguing for more of a social history approach that includes the lives of all people, even those who did not and could not write their own stories. To Zoe, a few mentions of these other experiences won’t do it; she wants a panoramic approach that seeks to understand it all. The argument over Zoe’s essay soon turns personal and has significant fallout for them both. If you missed The Niceties in New York, here’s another chance to see it at McCarter’s Berlind Theater. Production credits to Cameron Anderson (set design); Elisheba Ittoop (original music and sound design); Kara Harmon (costume design); D.M. Wood (lighting design). Dixie Uffelman is the Director of Production. Produced in association with Huntington Theatre Company and Manhattan Theatre Club. McCarter Theatre is easily reached from New York by car or train (New Jersey Transit to the Princeton Junction station, then the shuttle bus into Princeton. The shuttle ends a short walk from the theater and the university’s new arts district, as well as two innovative new restaurants. Vicki Weisfeld is an avid theater-goer and reviewer of stage, screen, and books at her website, vweisfeld.com. She lives in Princeton, New Jersey, and writes short stories, mysteries, and thrillers.